Front Row bar is a shrine to the Hawks. Open up the door to the Front Row in Clive, stroll inside and you’re instantly greeted by Herky the Hawk. Walk only a few steps into this sea of black and gold and you’ll find mahogany shelves full of autographed footballs, signed jerseys, shoes — anything related to the Iowa Hawkeyes. Framed pictures of game-day highlights, stadiums, players and more line the walls. Even the party room next door that serves as an overflow room looks more like it is an excuse to display Hawk items. More than a dozen tables and a couple of booths are emblazoned with a gold “I” and a pool table completes the look. Arriving on Iowa Hawkeye basketball game nights can sometimes be overwhelming, but the cheering crowd is subdued on this night, perhaps because they were winning comfortably. Walter Spoon, the grill master who cooks steaks on Monday and Thursday nights, frequented the spot on Wednesday with his wife, Amity. The pair met at the “old” Front Row and explained the previous location. Clay Cook bought the Front Row in 1999, Spoon says. At the time, it was located in Windsor Heights, just off University Avenue. 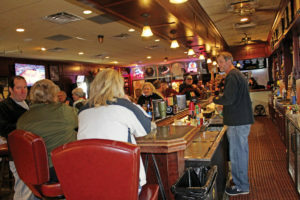 A lack of parking and space concerns were the main reasons Cook moved the bar to its current location on Swanson Boulevard in 2015. Amity and Walter like the place so much that they held their wedding reception at the new location. The wedding invitation list consisted of 85 people whom they met through Front Row. “Everyone is welcome and accepting of anyone who walks in the door,” she says. Employees have been honored as well with their own bobblehead image made to resemble them. The lookalikes are crafted by Bryan Guise. “If the employee is here at least three or four years, then they know they’ve made it if we have a bobblehead,” says Cook. Several years ago, the bar began featuring Open Mic night two times a month. Musicians of all abilities take turns on stage, singing and playing instruments.